After plenty of talk about who would be first to launch a smartphone with a 4K screen, it looks like Sony’s gone and done it, with a screen that has double the pixel density of the iPhone 6 Plus — despite being the same size. Today at IFA, Sony unscrewed the cap on three new Xperia smartphones — the anticipated Z5 and Z5 Compact, but also a brand new addition to the Xperia family, the flagship Z5 Premium (pictured above). That’s 808 pixels per inch — can the mind really make out that much detail? Apparently Sony thinks so. What was impressive about the display, in addition to the obvious crisp nature of the footage we saw running on it, was that it crucially didn’t overheat in our hands. Considering the Z3+’s overheating issues, I’m going to say that despite my limited playtime with the device, that felt rather reassuring. While on the subject of that new 4K screen Sony’s developed, you’ve also got the added ability to take 4K screen captures when viewing footage. That 32GB of onboard storage with a microSD card slot able to take a further 200GB will be more than necessary. 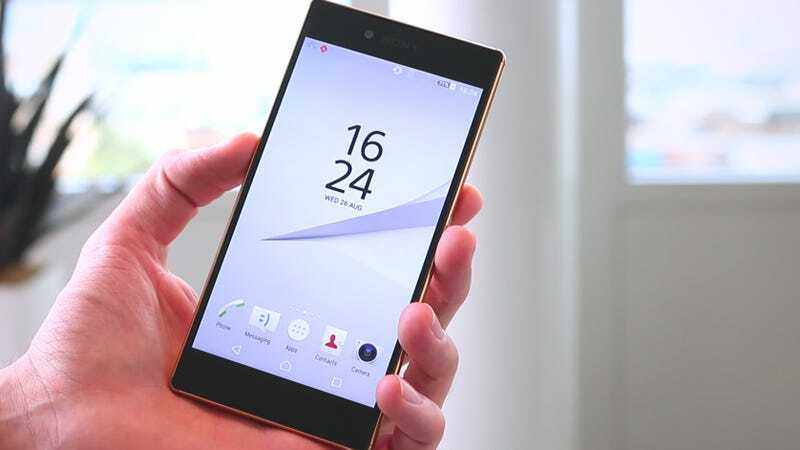 The Xperia Z5 Premium is a 5.5-inch handset running Android 5.1 (Lollipop) on a Snapdragon 810 octo-core chip and Adreno 430 GPU, with 3GB of RAM. Given the Snapdragon 820 has just reared its head, it feels a little long in the tooth, but it would’ve been quite an incredible feat for Sony to unleash a phone with Qualcomm’s latest that quickly. Sony’s imaging prowess was already widely-known, but with all three models, Sony sought to completely reimagine (pardon the pun) its camera. The first time Sony’s changed the camera module since the Z1 came out way back in 2013, the new phones are now brimming with the goods — a large 1/2.3 Exmor RS 23-megapixel sensor, and a F2.0 G Lens, plus the requisite LED flash. They’ve got the fastest autofocus a smartphone has ever seen, at 0.03 seconds — aka, faster than a human eye can blink. All three models feature a 5MP forward-facing camera with 25mm wide-angle lens. The video capabilities have also been upgraded, with SteadyShot tech meaning 4K video content can be captured smoothly and shudder-free. Another new feature is the integrated fingerprint sensor power button, which you’ve obviously seen in other manufacturers’ work, but is a welcome addition for Sony’s products. Compatible with FIDO online payments too — nice touch, Sony. Available in chrome, black and gold, the waterproof Z5 Premium has a huge 3430 mAh battery and will be out in November for no doubt a “premium” amount. Did it feel premium, you ask? Decidedly more so than previous Sony efforts, and the gold model I fondled was a really lovely, non-garish hue. The frosting you see on the Z5 and Z5 Compact helps differentiate a line which has a definite build quality and appearance you can pin-point, but actually, I’d like to see Sony take more design cues from the Z5 Premium in the future. The Z5 and 4.6-inch Z5 Compact feel familiar, and in truth don’t exactly break the mould of previous Xperia handsets. With its 5.2-inch screen the Z5 is the same size as the Z4, but actually weighs 10 grams more at 154 grams — not that you’d notice it. I didn’t, anyway. Running on the same Snapdragon innards as the Z5 Premium, with the same camera technology, the waterproof duo’s only differentiators from the Z5 Premium are the look, feel and size of the device, the lack of a 4K display, the battery size (the Z5 has a 2900 mAh unit; the Z5 Compact a 2700 mAh one), and for the Z5 Compact, just 2GB of RAM. The Z5 is available in white, black, gold, and green, from October, and the Z5 Compact will be available in white, black, yellow, and coral, the very same month.